Citation Information: J Clin Invest. 1999;103(6):R15-R21. https://doi.org/10.1172/JCI6179. The ε4 allele of apolipoprotein E (apo E) is associated with an increased risk for developing Alzheimer's disease (AD). This may be due to interactions between apo E and the amyloid-β protein (Aβ). To assess the effects of human apo E isoforms on Aβ deposition in vivo, we bred apo E3 and apo E4 hemizygous (+/–) transgenic mice expressing apo E by astrocytes to mice homozygous (+/+) for a mutant amyloid precursor protein (APPV717F) transgene that develop age-dependent AD neuropathology. All mice were on a mouse apo E null (–/–) background. By nine months of age, APPV717F+/–, apo E–/– mice had developed Aβ deposition, and, as reported previously, the quantity of Aβ deposits was significantly less than that seen in APPV717F+/– mice expressing mouse apo E. In contrast to effects of mouse apo E, similar levels of human apo E3 and apo E4 markedly suppressed early Aβ deposition at nine months of age in APPV717F+/– transgenic mice, even when compared with mice lacking apo E. These findings suggest that human apo E isoforms decrease Aβ aggregation or increase Aβ clearance relative to an environment in which mouse apo E or no apo E is present. The results may have important implications for understanding mechanisms underlying the link between apo E and AD. Nondenaturing gradient gel electrophoresis followed by Western blot analysis with goat anti–apo E antibody reveals that apo E in human CSF and apo E secreted by astrocytes are in HDL-like particles of overlapping size, mostly between 10 and 17 nm. Lane 1, pooled human CSF (20 μl) containing 100 ng apo E. Lane 2, pooled human CSF (30 μl) containing 150 ng apo E. Lane 3, astrocyte-conditioned media (20 μl) containing 100 ng apo E4 derived from GFAP–apo E4+/– astrocytes after 3 days in culture and collected as described (21). Lane 4, astrocyte-conditioned media (20 μl) from GFAP–apo E–/– cells. 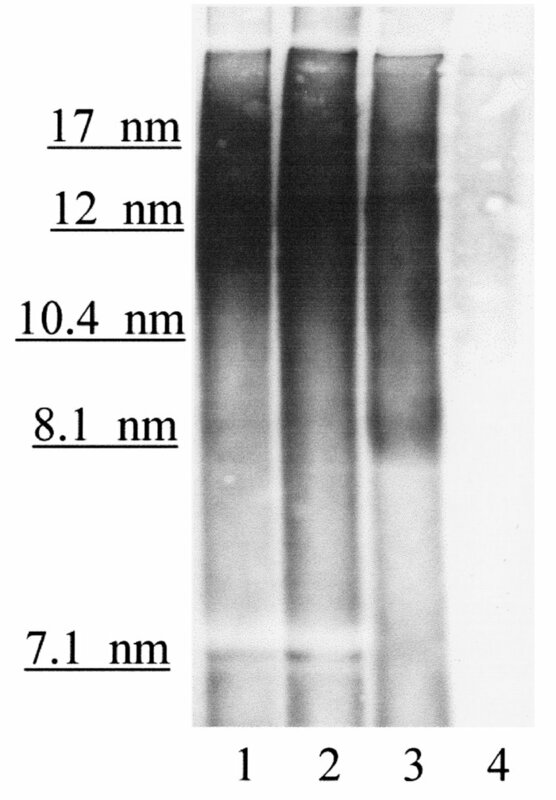 Size markers (Pharmacia Biotech Inc., Piscataway, New Jersey, USA) are expressed in nanometers. CSF, cerebrospinal fluid; GFAP, glial fibrillary acidic protein; HDL, high-density lipoprotein.